Agent Dash (v1.1) — Mobers.ORG — Your Daily Source For Mobile FUN! 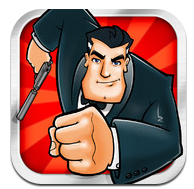 Use spy gadgets to help you on your way; equip jetpacks, parachutes and even slow down time! When the going gets too tough, call in support from a back-up agent! And when the time comes, draw your weapons and pull the trigger to destroy the base and make your explosive escape as the building crumbles around you. Compete with your Facebook friends no matter which device they use. Hone your skills and sharpen your reactions to make the perfect run and become Top Agent!